There's something missing from this photo which is included in Windows 7. Do you know what it is? I've yet to upgrade to Windows 8 and probably never will. However, I've been a Windows user since version 3.1 and with every new release I've been fascinated by the desktop wallpaper photos Microsoft chooses to include in each final version. So the first place I went was to my own computer, which is Windows 7. If you open that folder you'll see a nice photo of a lighthouse. As a photo enthusiast who loves lighthouses, this shot caught my eye. Where is it? I thought maybe Maine? I wanted to know where so if I was ever near the location I could travel there to check it out myself. I enjoy the challenge of finding out where someone else may have taken a photograph. I've done this numerous times in the past by looking for clues in an image. 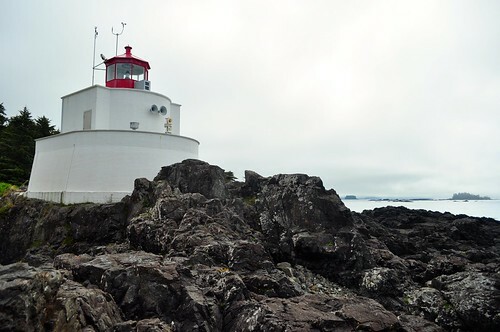 It is the Amphitrite Lighthouse located at Amphitrite Point, just south of Ucluelet, British Columbia. As I was zooming around the image looking for location details I noticed something. Here is the top of the original lighthouse photo, zoomed in at 100%. the left side of the roof in the sky? Original image zoomed to ~500%. Notice the odd patch in the sky? This is a tell-tale sign the image had been altered. Which, for some reason, I was very surprised at. I was curious. What used to be there and why was it removed? You can instantly see there used to be something in the sky that has since been wiped out. Maybe something attached to the roof. My first guess was a pole with a flag. Either way, the editing job was rather sloppy I'd say because the editing artifacts weren't that difficult to see in the first place. An average job at best. Next step was to look at other images of the same lighthouse to see what might have been in that smudgy spot in the sky. It only took one Flickr search. A moment later the answer was had. You can see those poles and instruments reaching above the top of the lighthouse. I found photo after photo of this lighthouse and all of them had the same poles. Here are the search results if you want to see for yourself. The only photo without the poles is the one included in Windows 7. Why does this matter? It doesn't really. Microsoft made no promise that the included sample photos weren't altered in some way. I only went through this process because I was curious to see what the truth was behind the photo. Sometimes curiosity kills the cat, but luckily I didn't have to leave the comfort of my own recliner to get to the bottom of this. Ya know, I always wondered where the lighthouse was. I always thought it was on the west coast due to the architecture of the lighthouse, the craggyness of the coast, the light, etc. So, today I wasted time googling images of lighthouses on the west coast. Thanks for the additional info. You are not alone. Curiousity killed the cat............LOL.......brought her back! Made me laugh! I came across your post in my own quest to find this little lighthouse. I had just narrowed it down to Pacific Northwest or Canada...and there you were. Good detective work!